PennsylvAsia: Tomodachi Festival at Carnegie Library Oakland, April 20. 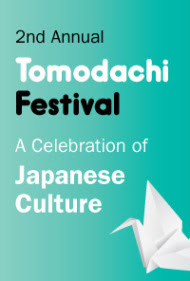 Tomodachi Festival at Carnegie Library Oakland, April 20. [j]oin us for Kamishibai storytelling, singing and dancing, kimono try-ons, origami art and more. Cookies will be served. The cookies will be provided by Yummyholic, and the event is put on by the library and the Japan-American Society of Pennsylvania. People interested in this may also want to check out "Camp Konnichiwa", offered at the library again this spring. There are two sessions left of "this four-week camp offering fun activities to help children learn Japanese": April 27 and May 6. Registration is required, and can be done so at the events' webpages or by calling 412-622-3122.